Dental disease is the most common disease in dogs and cats. However, dental problems are often overlooked until they are very advanced. An unhealthy mouth has a negative impact on a pet’s quality of life and overall health. Advanced techniques are often needed to properly diagnose and treat dental disease. At Tier 1, our veterinary team can treat even the most complicated oral health issues in our dental suite. Most of us know how painful a toothache feels, and it’s no different for pets. Sometimes they show symptoms of oral discomfort, such as dropping food, chewing tentatively, or salivating excessively. But in many cases, symptoms are subtle or not noticeable at all. Animals don’t always show us when they are uncomfortable, and they often eat despite oral pain. It is important to have your pet’s teeth examined often to identify problems early. A simple look in the mouth doesn’t tell the whole story, so comprehensive dental procedures are recommended on a regular basis. During your pet’s procedure, anesthesia is required to fully evaluate the mouth and treat any disease. Anesthesia allows for every tooth to be carefully examined and x-rayed. Dental x-rays are always necessary because many abnormalities are under the gumline and cannot be visualized. We will evaluate each tooth for periodontal disease, which is inflammation in a tooth’s supporting structures that results in gingivitis and bone loss. Some pets can have fractured teeth, orthodontic abnormalities, or lesions in the oral cavity. Cats are prone to painful resorptive lesions of their teeth and severe inflammatory disease of their gums and will be fully evaluated for these conditions. Once your pet’s mouth is examined, we will execute a thorough treatment plan. All teeth will be ultrasonically scaled and polished. If disease is severe, it is possible that teeth will need to be extracted. Your pet will feel much better when these teeth are no longer a source of pain. In some cases, advanced techniques can be utilized to save teeth from extraction. 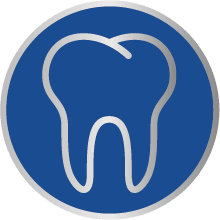 At Tier 1, we offer endodontic therapy, or root canals. The endodontic system, or pulp cavity, contains the nerves and blood vessels that keep a tooth alive. When a tooth is damaged or fractured, the pulp cavity becomes devitalized, resulting in infection and pain. A root canal is performed to remove the diseased pulp material and save the tooth from extraction. This preserves cosmetic appearance of the mouth and is important in police, military, or other working dogs to maintain the function of the tooth. Endodontic therapy is an advanced procedure that requires specialty expertise to be done properly and is not offered at most veterinary hospitals. Dental disease in pets is widespread but vastly undertreated. If your pet is due for a dental assessment or you suspect a problem with their teeth, please schedule a consultation with our dental team today.